Tie-dye an apron for the number 1 Dad and a matching tie-dye shirt for the little guy. This fun tie-dye set from I Love to Create makes a great gift for Father's Day and other occasions, and is a fun project to do with kids. Wet apron and shirt. Wring dry. Or, wash in washer with no soap and run through spin cycle. Do not dry. Cover work surface with garbage bag. Wearing gloves from kit, fill dye bottles with water to line indicated. Shake each bottle to thoroughly mix dye. Place apron and shirt onto work surface. Smooth apron with hands. To create bull’s eye design on shirt, pull up center of shirt. Wrap a rubber band tightly around fabric, 3” from end. Wrap another rubber band 3” below first. Lay onto work surface. Squeeze brown dye onto part of shirt above first rubber band, turning and unfolding areas so dye penetrates inside. Squeeze olive onto section between rubber bands. Squeeze black onto remainder of shirt. Leaving thin stripes of undyed areas between colors, squeeze olive lengthwise onto first third of apron, brown onto second third and black onto remainder. Cover pieces with garbage bag. Let set for 4 to 6 hours. Wash in full load of water with a small amount of laundry soap and no fabric softener. Dry in dryer without softener sheet. Iron apron smooth, using steam. Cut desired letters and numbers from Sticky Fabric Stencils, leaving as much border as possible. Remove backing. Position letters and numbers onto bib of apron, running fingernail around edges to ensure a tight seal and trimming as needed to space evenly. Create an extended border around stencil and fill in any gaps between letters, using masking tape. Squeeze a small puddle of Matte Ebony onto foil. Tap flat end of cosmetic sponge into paint. Pounce excess paint onto foil. Pounce paint into stencil, applying a thin, even coat. Remove stencil. Let dry. Tie a knot at one corner of bandana. Apply a thick bead of Fabric Fusion to back of knot. Press into place on side of apron. Secure with masking tape until dry. Remove tape. Got some plain shirts or aprons that you would like to spice it up then why not tie-dye them. 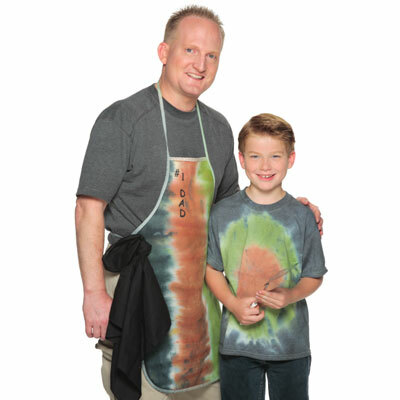 Make dad and yourself a matching tee shirt or aprons for Father's Day. Thiis is such an easy thing to make and you can choose your own colors and kids love to tie-dye. You can even make one for mom too. Add a chefts hat and you are all set. You can even puta saying on it too.